Huge empty playground on northwest side now has six basketball courts, a futsal court, soccer field and 200-meter track. 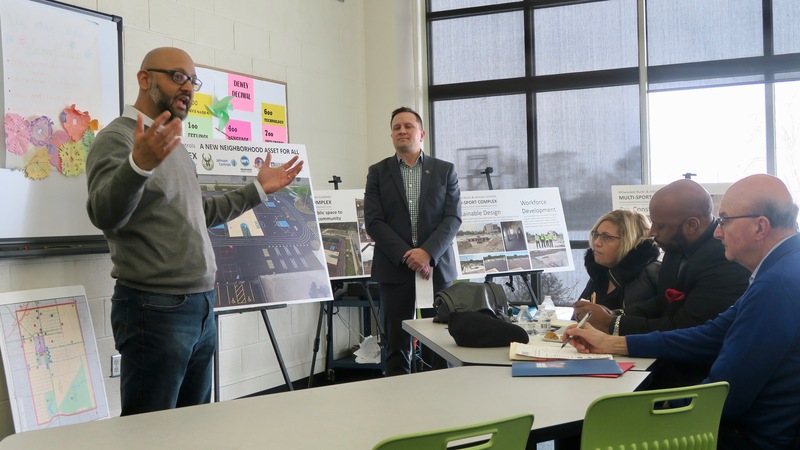 Arvind Gopalratnam and Paul Williams explain the importance of community-building at the new multi-sport complex at Browning Elementary School. Photo by Cynthia Crawford/NNS. Browning Elementary School’s playground used to be a dead zone of 55,000 square feet. But in 2017, the space was transformed into a multi-sport complex with six basketball courts, one futsal court, a soccer field and a 200-meter track. Since then, the complex has changed the way community members and students play outside and also is used by the Silver Spring Neighborhood Center that shares a building with the school at 5440 N. 64th St.
Johnson Controls and the Milwaukee Bucks financed the $150,000 construction cost, and the organizations will give an additional $600,000 over the next 10 years to fund youth-focused community programs. Programming will include organized sports groups and more casual activities such as cookouts. Tony Williams, Browning’s security supervisor, said the space has improved the experience of playing outside for students and community members. He moved to the surrounding Westlawn Gardens neighborhood in 1995 and is excited to see how the complex is helping the area to improve. 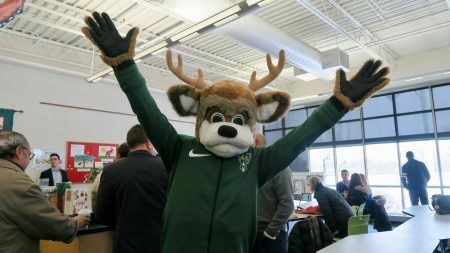 Bango greets MANDI judges for a site visit at the multi-sport complex at Browning Elementary School. Photo by Cynthia Crawford/NNS. Williams said he still remembers how it felt to see the complex for the first time. “Everyone wanted to know what was coming next, and when it came, it was the best ever,” Williams said. Staff members now use the complex as much as students and are able to have more interactions with them, he said. Playworks, a company based in Prior Lake, Minnesota, designed the complex. Its design is meant to promote social inclusion, said PJ Dever, Playworks program director of Wisconsin. There are multiple basketball courts so players of all skill levels can have a comfortable place to play. The foursquare spaces have lines as guides on where to begin, and different colors show which games are played in certain areas. Playworks also has trained fourth- and fifth-grade students as junior coaches who monitor the other students during recess and make sure the space is being used properly. The project was led by Johnson Controls, the Milwaukee Bucks, Milwaukee Public Schools, Silver Spring Neighborhood Center and the Housing Authority of the City of Milwaukee. The Silver Spring Neighborhood Center hopes the complex will improve outreach to the Westlawn Gardens neighborhood, said Devin Hudson, development director of the center. Browning’s principal, Raymond Unanka, said he believes the complex has improved the behavior of the students. He has noticed a decrease in suspensions and has seen the way students have learned to conduct themselves when playing outside. Arvind Gopalratnam, vice president of social responsibility of the Milwaukee Bucks, said all parties came together not only to create a space, but also to engage with the community. Great up-with-MKE story. Would have loved to see a photo of the complex.